Many of us reach the point in our lives where we find getting up and down stairs is increasingly difficult. This may well be the time move your bedroom downstairs if your home is suitable, or perhaps to contemplate making the move to a bungalow. But for many people the perfect solution to continue living independently in their existing home is to install a stair lift. There are a number of types of stair lifts on the market and it is important to gather information and seek advice so that you can select the one that is right for you. These are suitable for homes with a single straight flight of stairs. They are easily fitted and provide a comfortable, smooth ride. For convenience and space-saving the seat can be folded against the wall when not in use. 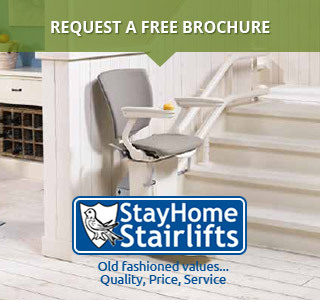 Find out more about straight stair lifts. These are designed for homes which have a turn or bend in the staircase and certain models can even cope with spiral staircases. The system involves a curved track being fitted to one side of the stairs and the chair can be configured to offer a smooth ride right up to the landing. Find out more about curved stair lifts. These are designed for people with particularly limited movement and flexibility who would otherwise find it difficult to sit on a conventional stair lift. A perch stair lift provides a shorter seat and ergonomic support to allow the user to comfortably ‘perch’ on the lift in a semi-standing position. These lifts are often suitable for particularly narrow staircases. Find out more about perch stair lifts. These are specially designed for outdoor use and allow a person with restricted mobility to cope easily with steps on their garden path or at the approach to an exterior door. This allows the user to continue enjoying his or her garden or outside space. Find out more about outside stair lifts. These are second-hand ones that have been restored to their original condition and are often a good bet if you are on a tight budget. In almost all cases these will be straight stair lifts rather than made-to-measure curved ones. Find out more about reconditioned stair lifts. Stair lift prices vary according to the nature of your particular needs and the configuration of your staircase. In general terms a straight stair lift is the cheapest option and the price will increase to take account of curves, unusually long staircases or special features. As a rule of thumb each corner of the staircase will double the basic price. In some cases where your home has a semi-landing where the staircase turns it may be cheaper to install two straight lifts rather than a curved one. This will only be suitable, of course, if the user has sufficient mobility to transfer easily from one stair lift to the other. All local councils offer some degree of financial assistance with stair lifts. Arrangements vary from one local authority to another and the four home nations each have their own particular assistance schemes. In general terms any financial assistance will be means-related, but all councils can offer specialist advice and many of them carry stocks of reconditioned second-hand stair lifts. Find out more about disabled facilities grants and how to apply. Installing a stair lift can be a significant investment in your home and it is important to get the right advice before you make your purchase. All reputable stair lift companies will be happy to provide guidance and quotes and most local councils have an occupational therapy specialist who can make an assessment of your needs.